» Reviewed by Marv Lachman: JOHN STEPHEN STRANGE – The Strangler Fig. 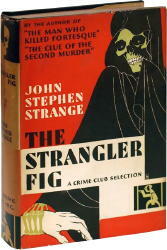 Reviewed by Marv Lachman: JOHN STEPHEN STRANGE – The Strangler Fig. JOHN STEPHEN STRANGE – The Strangler Fig. Doubleday Doran/Crime Club, hardcover, 1930. Reprinted in paperback as Murder at World’s End: Mystery Novel Classic #59, no date stated, . Strange’s amateur sleuth is Baltimore attorney Bolivar Brown, who goes to World’s End Island off the Florida coast where there was a disappearance seven years ago, and now a murder. A hurricane occurs, as obligatory in Florida mysteries of the 1930s as drugs are in the 1980s. This is a quaintly old-fashioned mystery whose plot, characters, and atmosphere are not strong enough to warrant the time spent. However, the unconscious humor made it worthwhile. Bibliographic Notes: Mrs. Tillet wrote a total of 22 mystery novels in her career, the first appearing in 1928, the last, The House on 9th Street, in 1976 when she was 80 years old. All of them were published under Doubleday’s Crime Club imprint. While she used other leading characters more than once, this was the only appearance of Bolivar Brown. This discusses three of her novels, including The Strangler Fig. I’m not real fond of this author. But I never linked her with Rinehart and the Had I But Known tradition. Nor did I find her works humorous or campy. That is just an approach to old mystery fiction I almost never, ever use. At one time I made a concerted effort to collect all of the Doubleday Crime Club books. I stopped when I came to the realization that I was accumulating hundreds of books I was never going to read. Those I sold off, but I kept the rest, including all of the ones by John Stephen Strange. I confess, though, I never read any of his (hers) either, and between Marv’s old review here and reading your take on the books, Mike, I don’t imagine I ever will. Even though you don’t link Strange to the Mary Roberts Rinehart school — on the basis of an early novel you call her a woman’s romance writer with little detectival technique — the quotes Marv supplies certainly sound like solid HIBK tendencies to me. In any case, color me unimpressed. I’d say it might be interesting to discover if she improved over the years — her long career seems to say she had her followers — but all in all, I’d rather it be done by you, not me, and it sounds as though it won’t be you, either! I delivered the Sunday paper to Ms. Tillett during her final years convalescing in Chester, CT. I remember her telling me she had her (turned out to be final) book published, “The House On 9th Street” that year. She was an interesting lady, who I enjoyed meeting and chatting with every Sunday. She gave me a copy of James Herriot’s All Things Great And Small one Xmas. What wonderful memories of her, Mark. Thanks for sharing them with us.